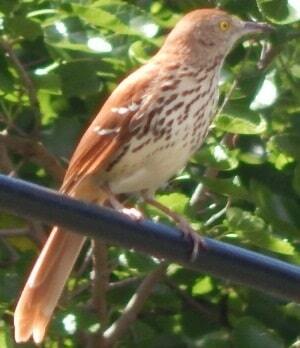 Spring is the time you'll most likely see the Brown Thrasher. 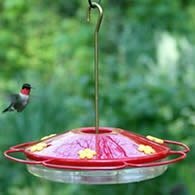 Not so much because of this birds migratory patterns, instead, habitat is most likely the cause. These birds prefer dense thickets and woodland edges. These birds are partial migrants. 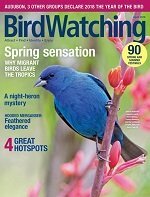 This means that Northern populations of this bird move south, while southern populations are year-round residents. About 9 - 12 inches in length, with reddish-brown upper parts, heavily streaked with black below. A long tail, 2 white wing bars, and pale-yellow eyes. Male and female similar in appearance. As spring begins, male thrashers arrive first. Claiming territory and choosing perches from which to sing from. Within 10 days the females arrive and the males begin their loud sweet song in order to attract a mate. 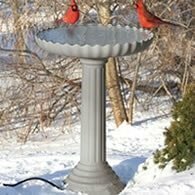 Rarely seen by the average backyard bird watcher, the male may walk in circles around the female while dragging his tail along the ground. The female may pick up sticks as a sign of her willingness to pair with the male. Nest building begins as soon as the pair bond is formed. Both male and female birds share in the nest building process. The cup shaped nest is constructed with an exterior of twigs, grass, and leaves. The inside is lined with fine grasses and rootlets. Place anywhere from the ground up to 15 feet in height. Often placed in thorny shrubs. Very aggressive at defending the nesting site. An average clutch of 4 eggs are laid. Eggs are variable in shape and color, generally a light blue with dark marks. Incubation is done by both male and female. incubation last 12 - 14 days. Fledging generally 9 - 12 days after hatching. 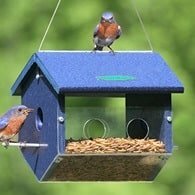 The female will help feed the fledglings for just a few days before beginning a second nest. Usually 2 broods each seasoned are attempted. 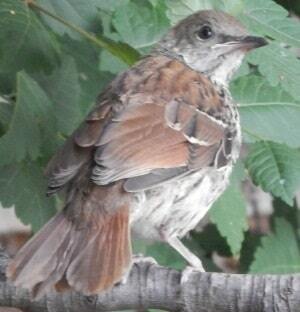 The feeding habits of Brown Thrashers take place on the ground. Tossing leaves to look for insects is one of the ways it is thought to have gotten its name. Most of the diet of the thrasher is insects. 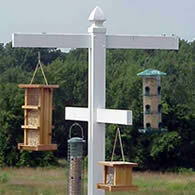 These birds also feed on wild berries, snakes, tree frogs, and lizards.